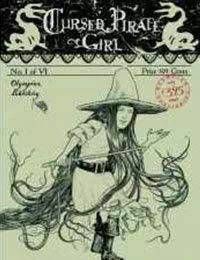 Cursed Pirate Girl is a buddy story that takes place in 1728. It is about said pirate girl and the daughter of the governor of Port Elizabeth, Jamaica, a town made famous by the Pirates of the Caribbean movie franchise. The dialogue is snappy, with just enough archaic slang to give it the appropriate Restoration Era flavor. The events of the story, however, are only a conduit for the most brilliant part of this comic...the plethora of odd characters that are crammed into every page.